The kids are out of school and everyone is ready to venture off somewhere other than home. Deciding where to go can be the most difficult decision to make, but once you do, the planning and details come together much easier. Family-friendly holidays are best when you plan ahead and know what to expect. They are great in terms of how much everyone in the family enjoys themselves. In this article, you’ll read about the French Alps as a family activity holiday destination. As with any holiday, there is certain information that helps with proper preparations before leaving home. If you don’t live within driving distance, there are a few airports to choose from as your destination if you decide to fly. Some of the more common airports for visiting the French Alps are Lyon, Grenoble, and Geneva. Driving may be a better option for your family if you live near your final stop. Even if you are flying into one of the airports, renting a car will give you some more flexibility to travel around the area where you are staying. Check in with rental car companies in the area to see what rates and cars are offered to make sure they can accommodate your family and luggage. The average temperatures in July range from 59-75 degrees Fahrenheit (15-24 degrees Celsius). Because these are just the average temperatures, it is possible for it to be much warmer on certain days. Be sure to take a look at the local weather where you will be staying to influence your packing strategy. It’s a good idea to bring a variety of clothing items to allow for layering when temperatures are warmer during the day and cooler at night. Also, consider the type of activities you will be doing to help finalize your packing list. For example, if your accommodations offer a pool, you may want to remember to bring a swimsuit if you decide to go for a swim one day. Rather than stay at the resort or whatever other accommodations you have selected, there are several notable places to consider venturing out to experience even more of what the French Alps have to offer. The French Alps is home to three of France’s national parks: Écrins National Park, Vanoise National Park, and Mercantour National Park. Each park has its own collection of animals, landscapes, and plant life to enjoy when visiting. These parks offer special presentations to learn more about the history of the park and what is within their borders, hiking tours, and public events that are all family-friendly. While snow skiing is popular during the wintertime, you may get a chance to try some water skiing during the summertime. Lake Geneva, Lake Annecy, and Lake Bourget are the three lakes located in the French Alps. They are perfect for a variety of activities you can read more about later. The towns surrounding these lakes offer their own events and museums that make them excellent locations to take your family. Each July, Evian-les-Bain, on the south shores of Lake Geneva, hosts a classical music festival. For those interested in animation, Annecy is home to the Animation Film Museum. Among the several towns you and your family can visit, other prominent towns located in the French Alps include Chamonix, Grenoble, and Megéve. If you prefer to enjoy the beauty of Mother Nature from your vehicle, plan a drive on the Route Napoléon or Route du Galibier. There isn’t just an assortment of places to see in the French Alps, but there is quite the selection of activities that are fun for the whole family. You can plan your own itinerary or work with professionals who specialize in family activity holidays. Here are some ideas for activities to keep in mind when putting together your dream family holiday to the French Alps. You’ve already read about the gorgeous lakes that make up part of the French Alps’ landscape and one activity your family can participate in when visiting. The fun doesn’t stop there! Whether you bring your own boat or rent one, there are plenty of water sports and activities to dive into. Along with water skiing, your family can engage in other boat-pulling types of fun like tubing and wakeboarding. The lakes are just one water source that can provide entertainment on your holiday. Some companies offer white water rafting and kayaking in other waterways that go through the French Alps, especially in the southern areas. When you’re on the water, remember to apply sunscreen and have plenty of towels handy. It may be warm outside the water, but, after being submerged, you might find the water is still quite chilly. That same water acts as a reflector for the sun so make sure to reapply if you do jump in the water because that’ll wash away some of that protective layer. Instead of staying at a resort, your family may decide to be a tad bit rustic by camping, whatever that term means to you. The French Alps are home to several campgrounds that can be reserved whether you’re sleeping in tents, an RV, or renting a chalet. You might even consider booking campsites at different campgrounds to experience the different areas of the French Alps all in one trip. A few campgrounds exist near popular lakes and other tourist spots so activities, like hiking, are easily accessible. The variety of locations really opens up the possibilities of what your family can experience from one place to another. Even if you’re camping, some grounds offer restroom and bathing facilities for patrons as well as markets for purchasing food. Some campgrounds have fewer amenities, so be sure to look at what is available before booking a campsite or chalet. If you’re even more down for roughing it, you should consider backpacking in the area. Use this guide to determine which area is best for your family to visit on your backpacking holiday. Perhaps you are having trouble deciding on a good time to take your family holiday. One easy way to narrow down dates is to plan it around one of many festivals held during summertime. The classical music festival in Evian-les-Bain isn’t the only music gathering you’ll find. Chamonix organizes an annual festival called the Cosmojazz Festival that runs from the end of July through early August. For children (and adults) who aren’t scared of loud noises and are fans of bright colors, a festival that is sure to get their attention is the Firework Festival in Annecy. Better yet, why not go to a festival created with children in mind? Au Bonheur des Momes in Grand Bornand is a cultural experience that is perfect for a holiday right before school goes back in session. Some families prefer to keep their holiday activities a little dirty and more traditional when it comes to being outdoorsy. 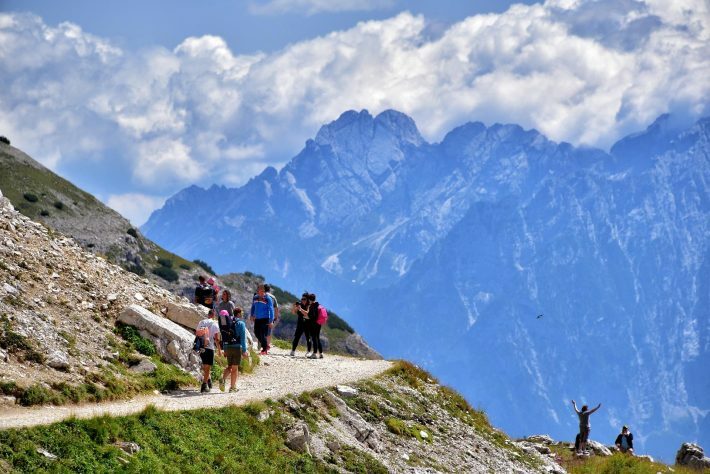 There are plenty of places to hike, mountaineer, and mountain bike through the French Alps. As you can see, there really is no shortage of activities that your family can partake in on your holiday. There’s literally something for everyone in your family whether they prefer to relax or go on an adventure. The possibilities are endless so you may just have to make a second trip back next summer.